Aaron Harris (born November 11, 1977) is an American drummer, best known for his career with Los Angeles, California-based post-metal band Isis. He was with the band from its inception in 1997 to its dissolution in 2010. Since Isis' demise, Harris has become increasingly involved in his career as a Producer/ Mixer, working with such acts as Pelican, Mental Architects, Crone, Jakob, The Jezabels, Mothra, and more. 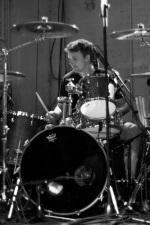 He is also a part-time drum tech for Danny Carey of Tool, and Abe Cunningham of the Deftones. Harris has also toured mixing live sound for Pelican, Jakob, Melvins, and The Jezabels. "I have yet to find a situation where the Violet "Amethyst Vintage" doesn't sound good. I've used them recording acoustic guitars with ISIS, drum overheads on the debut record from my new band Palms, and tracking various percussion sample from glockenspiel to timpanis with Tool drummer Danny Carey. I also love the shock mount system which can easily be adjusted to fit just about anywhere. This is an amazing microphone."